To hell with the rules. I was finished with them all. 3.5 stars. And so it ends. Many of you know that I prefer my contemporary romance reads to have some sort of "bigger picture" story outside of a couple's struggles with their relationship. But sometimes, a romance is just a romance, and a book is better for not trying to be more than what it is. This is one of those times. Sure, there were tornadoes, fires, and runaway horses. Yes, there was a huge, world-rocking moment for Rose and Noah which had nothing to do with their relationship. However, my reason for reading is Rose and Noah. We readers wanted to know - were they finally going to choose whether to be Amish or English? Who wins the war? Stubborn Girl or Mr. Suspenders? I'll never tell. 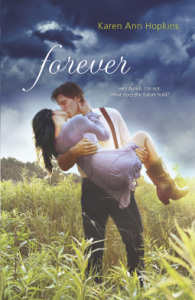 I appreciated how this story chose to show the struggles of a couple who were determined to be together "forever" at such a young age. It was inevitable that Rose and Noah were going to have to deal with the consequences that stemmed from the choice they made. Even with the sweet, "all encompassing" love story, these two didn't get off the hook quite so easy. Romance is lovely, but relationships take work after the dust setttles. Generally, it makes me uncomfortable to see two characters so young trying to pledge forever to each other, but in this case, it works...because of the hardships which are thrown at this couple. Their story is sweet, stressful, and even thought-provoking at times. How can two different cultures mesh together, when neither one is designed to fit with the other? is one I can relate to. I've been there. I know what it's like to want to make the situation work, even when everyone is saying that it's not a good idea. The love story is very potent, and it will make some people roll their eyes. But for me, I loved the way that it was written, and I think the author did a great job of showing both the positives and negatives of choosing to give up everything for love when you're still young and learning. Sam's chapters weren't necessary, but since I wasn't bored, it wasn't a big deal. I think I liked book 2 just a little bit better, but overall, I'm pleased with how things ended. I'm very glad I read this trilogy. Plus, Amish stories are so fascinating. I don't think I'll ever get tired of peering in the windows of various religious and cultural groups, just to see how the other side lives.